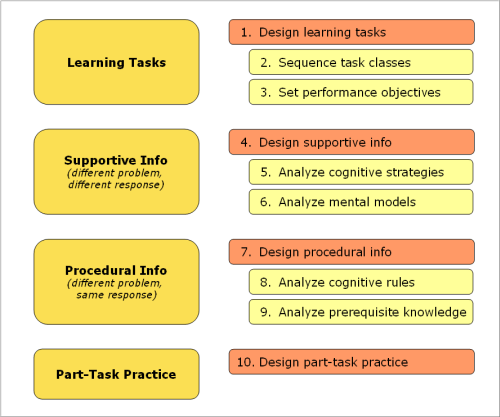 The previous two posts in this series about Ten Steps to Complex Learning were the first ones dealing with procedural information. Step 8, analyze cognitive rules, continues that focus. In the Ten Steps, cognitive rules and procedures are how you carry out recurrent tasks in a correct way. “Recurrent task,” to authors van Merriënboer and Kirschner, means one you perform the same way every time. The procedural part of solving that math problem involves a set of rules that for the most part ignore the numbers in the equation. In other words, procedural rules are algorithmic, not heuristic; they’re a set of steps and not a handful of rules of thumb. vM&K says that cognitive rules are “strong methods.” If you follow the rules, you get the right result. Perform multiplication or division before addition or subtraction; perform operations inside a parenthesis before those outside the parens. Strong methods tend to have limited flexibility; they apply in very specific circumstances. Rules for arithmetic don’t do you much good in spelling. Specifying if-then rules gives you the building blocks for designing the procedural information your learner will work with. Your analysis also becomes the foundation for part-task practice (the subject of Step 10) to build automaticity in the use of procedural information. Working with existing documents and interviewing expert practitioners can take two main forms. Rule-based analysis applies when there isn’t a specific order in which to perform the steps. vM&K have an extended example about rules for efficiently stacking a set of different sized buckets; it’s similar to rules you’d use for solving the Towers of Hanoi puzzle. You use an information-processing analysis when order does matter, such as following a fault tree when troubleshooting. To me, this is a good way to highlight the differences between algorithmic and heuristic approaches. Many experts have so automated the rule-based stuff that it seems intuitive to them. Still, when you’re dealing with entry-level behavior, vM&K’s step-by-step approach enables novices to achieve the desired result in any situation to which the procedure applies. Note that it’s important to validate your analysis. That involves at least two dimensions, I think: having exemplary performers review the resulting rules and procedures, and having typical learners try them out in context. Step 8 says that you shouldn’t get too granular in spelling out the procedural rules. You don’t want to say, “Retrieve X from your long-term memory.” On the other hand, vM&K say it’s easy to overestimate the prior knowledge of your learners. All the more reason for quick prototyping, I’d say, if you’re actually going to revise the material based on the tryouts. Specificity is one of the things that distinguishes procedural tools from supportive ones. A flowchart or job aid for reporting airplane flight status (arrived, departed, delayed, ontime, early, late) could be extremely specific; one for dealing with difficult customers would have to be more general. From experts and existing procedures, you can build the correct rules. It’s useful (to say the least) to know common errors and misunderstandings (or “malrules” ); these become important resources for learning design. A malrule, in contrast, is an erroneous procedure. It could be the result of what vM&K call intuitive models, as discussed earlier in this series. It seems logical to shut down the computer by switching the power off; that’s what you do with other electronic devices. Thats because by design you want to encourage compilation (the building of specific rules by the individual) and, often, automaticity. So you explicitly present the rules or procedures just in time, along with the task, following the guidelines mentioned with Rule 7 (previous two posts in this series). That’s where the well-designed displays come in. They don’t fiddle around with nice-to-know stuff; they don’t needlessly split attention. You can also use the rules to design effective demonstrations of the skills in question, and to develop corrective feedback. “Wrong!” isn’t usually good feedback, though it’s important to make clear that the response is incorrect. Errors and malrules–easy to uncover through tryouts–offer potential for design. You can focus learners’ attention on rules or steps that are prone to error. (“This is tricky, and you may get it wrong the first few times.”) Displays of procedural information can include error-recovery steps. And providing many demonstrations of steps with a high chance of error means that learners have more opportunity to perceive. Next time: Step 9, analyze prerequisite knowledge–what you need to know in order to perform recurrent aspects of a complex task. computer-competition practice photo by iBjorn.